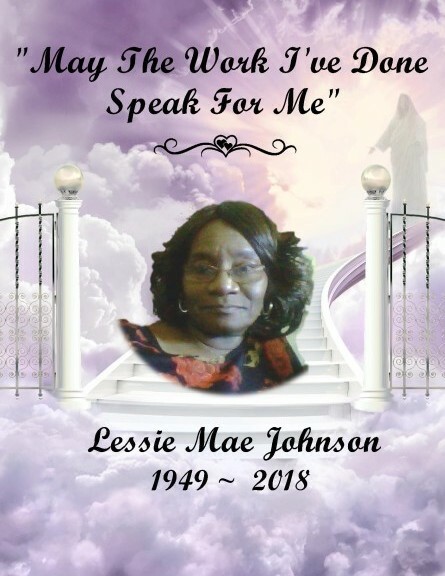 Lessie Mae Johnson, age 69, transitioned to her heavenly home, Thursday, August 30, 2018 while under the care of USA Health University Hospital in Mobile, Alabama. The family has arranged a service in loving memory of Lessie at Mt. Pleasant Missionary Baptist Church, Yellow Bluff, AL on Saturday, September 8, 2018, 11:00 am. The interment will follow in the churchyard cemetery. Christian Memorial Funeral Homes, LLC sends condolences to the family.